Baha Mar, a $4.2 billion mega-resort, sprawls along Cable Beach on Nassau in the Bahamas. The development comprises three hotels—the 1,800-room Grand Hyatt Baha Mar, the 299-room SLS Baha Mar, and the 237-room Rosewood Baha Mar—a 100,000-square-foot casino (largest in the Caribbean), an 18-hole Jack Nicklaus TPC golf course, an ESPA spa, a grottoed pool with waterfalls, a dozen restaurants and cafes and an equal number of bars, art galleries focused on Bahamian art, boutiques featuring luxury designers and local artisans, and some 3,000 feet of landscaped beach, the last bordered by a sanctuary with native Bahamian flora and fauna. And, yes, it has tennis as well: a handsome nine-court hard, clay, and grass complex overseen by staff from Peter Burwash International. Several things set the Racquet Club at Baha Mar. There is the grass court, to be sure, but also appealing is the generous layout, with courts on all four sides of the well-stocked pro shop. Peter Burwash International has installed veteran pro Karl Vukobrat to direct operations. Originally from Montreal, he joined PBI in 2001 after several years of hopscotching the world with Club Med. Between them, they've posted him to 17 countries on five continents. At Baha Mar, he's joined by head pro Alexander Barnes, a Division I player at Drexel University who taught on Martha's Vineyard and in Greater Philadelphia before his signing on here. Tennis Programs. It is never easy to compete with a beach (or a casino, for that matter), and the weekly calendar allows for flexibility with a daily walk-in 90-minute drill clinic as well as a smattering of beginners' clinics, complimentary kids; clinics and junior match play. But by far the most unusual event each week is a Grand Slam Social Mixer that gives guests an opportunity to play on three of the Grand Slam surfaces: hard, clay, and grass. And in a nod to technology, a list of the week's tennis activities can be found in every room—not on the usual ring binder labeled "Hotel Information" but on an interactive tablet with everything you could possibly want to know about the resort, including maps, restaurant menus and hours of operation, and calendars of everything going on. The racquet club also hosts events: The Necker Cup moved to Baha Mar in 2018 after hurricanes devastated its previous venue in the British Virgin Islands, and although it will not be back, there are plans to host PBI World Camps. Beach. The resort fronts 3,000-feet of landscaped beach that borders a sanctuary that lets guests interact with native aquatic life while learning about the importance of efforts to protect it. Golf Courses. Jack Nicklaus the 18-hole Royal Blue™ TPC golf course. The layout of rolling hills and limestone outcrops takes in view of the Atlantic along the front nine before plunging into the woods on the back. Spa. ESPA Spa at Baha Mar, the only one in the Caribbean, has 24 treatment rooms to deliver a variety of treatments based on local holistic practices and native ingredients. And ... Watersports abound, including stand-up paddleboards, single and double kayaks (including some with clear bottoms), zayaks (reef boards), Hobie Cat sailboats, water hammocks, floating lounges, personal floats, snorkels, fins, and masks. Not to mention up-close encounters with such aquatic life as turtles, rays, and nurse sharks at the Sanctuary. The Explorer's Club takes kids on a variety of excursions around the resort to learn about—and interact with—native fauna and learn about the Bahamian environment and culture. There are three hotels at the resort: the 1,800-room Grand Hyatt, the 300-room SLS Baha Mar, and the 200-room Rosewood Baha Mar. Just over 100 of the rooms at the SLS are residences with kitchenettes, while the Rosewood contributes its own three- and six-bedroom oceanfront villas. It takes a lot of restaurants to feed the guests of a 2,300-room resort, which is why Baha Mar has more than a dozen and a half dining outlets. These range from casual to fine dining; beachside and poolside; early and late; American, Bahamian, Asian, Latin; seafood and barbecue. And those are supplement4d by another 15 or so cocktail lounges and bars. 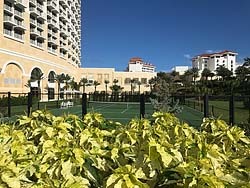 More than 18 hours of instruction and competition, including a "Grand Slam" round robin on the resort's hard, clay, and grass courts, as well as a farewell party, are built into this 5-day/4-night package. Multiple lodging options are available. For more information, visit PBI World Tennis Camp. The rsort has 299 rooms, suites, and residences. Travel Instructions. Flights to Nassau land at what is now Lynden Pindling International Airport (NAS), a 12-minute drive from the resort. General Tourist Information. For general information about travel to the Bahamas, visit the Islands of the Bahamas website.